Participating in CS-Cart community for several years, we have noticed that new CS-Cart users come out with the same basic questions every time. That's why we've decided to make things a little easier. Just getting started with CS-Cart? Good platform choice, the tips below are here to save your time. Clearing your cache is a good and necessary thing. After installing new third-party add-ons or making any changes in the source code, you should clear the cache (old cached data) to see your changes. 1. In your admin back-end go to Administration → Storage → click on the Clear cache option. 2. Add ?сс&ctpl to the admin url (for CS-Cart 4.0.1 - 4.0.3) or ?сс (for CS-Cart 4.1.1 and up). After the CS-Cart installation you will see this line in the storefront footer. It links to the CS-Cart website. In most cases, CS-Cart license holders don't need it. After that clear the cache. Fill out your company information in the Settings → Company to display your correct company name in the footer next to the Copyright sign. Save. There we go, now your Copyright in the footer looks good. Sometimes CS-Сart license holders forget what CS-Cart version they use. There is an easy way to learn the version. Just type ?version to the website url. Go to the root directory of your installed CS-Cart, open the init.php file. After that nobody will see your cart version if adding ?version to your website url. But you can always find your cart version in the config.php file located in the CS-Cart root directory. Just open this file and search for the version. It is not obvious but simple. In the admin panel go to Design -> Layouts. Click on the Home page tab and you will see a little gear icon next to the title. Click this gear icon and input the Page title, Meta description, Meta keywords. It is possible to change standard language variables in CS-Cart with your own text. It can be easily done via Administration → Languages. Enter the text you would like to change in the Search for pattern input box. In the Translation tab it will be necessary to enter your Value. Don't forget to save changes. On the example below on the left you see the standard CS-Cart text, on the right the changed text via Languages. Also, for changing/translating the text in the storefront use the on-site text editor. Go to Administration -> Languages -> Translations and choose on-site text editing by clicking on the button next to the Save button. It's easy but not obvious again. 1. In the admin panel, go to Settings -> General. 2. Click the Close storefront checkbox. 3. Enter some secret text in the Access key to temporarily closed store field. For example, if your CS-Cart url is http://www.your_site.com and you enter example in the field, you will need to use the following URL to access your store: http://www.your_site.com/index.php?store_access_key=example. To change the standard Store closed image and text, you should make changes in the store_closed.html file located in the root directory of your CS-Cart installation. 1. Go to Settings → General again. 2. Uncheck the Close store checkbox. CS-Cart has an in-built theme editor that makes it easy to change store colors, fonts, logo , etc. Just go to Design -> Themes in the admin panel and start customizing. For more detail about the Theme Editor possibilities, please have a look here. That's all for now. 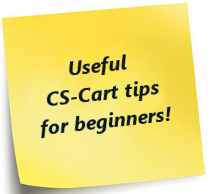 But, starting using CS-Cart you will definitely have lots of other questions. If you need a custom modification for your CS-Cart online store, we will be glad to help!